Want to know how to catch, cook and eat it? Need help identifying what you’ve got on the end of the line? If that sound like you, then you need this book in your tackle box before your next fishing trip or visit the beach. And to make it an even hotter deal, we’ve thrown in some sure-fire tips on how to cook just about everything that’s edible in our coastal waters as well. If the fish take a while to bite, there are some salty laughs to be had from our old mate Crimpy, the Michelangelo of fishing cartoons and spinner of some of the best fishing yarns this side of the nearest cray-pot. Daryl Crimp, who lives in Nelson, is that irrepressible fishing guy who makes the world’s best whitebait omelette, and who loves the sport so much that he’s started his own newspaper, The Fishing Paper. 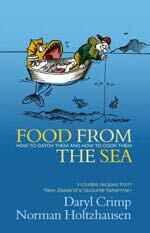 Norman Holtzhausen is the fishing editor of Trade-a-Boat magazine and a keen seafood aficionado. Together they’ve created the perfect book for everyone who loves fish.